Can someone measure the length (front to rear) of the front and rear wheel well openings on a 73-77 Chevelle? I want to compare the size of the opening to my Grand Prix. Do you need the measurement of the whole arch or just strait across the bottom? Straight across the bottom. Thanks! I am in for the night but I will get that for you tomorrow. Perfect, thank you very much. I'm trying to make a decision on wheel/tire sizes so I can also make the decision as to which brakes I'm gonna run on my Grand Prix. 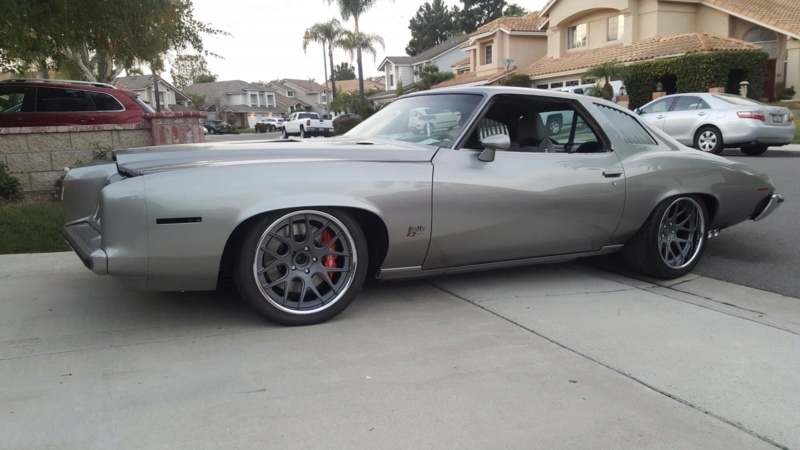 There's quite a few pictures online of Chevelles online with 17-18-19" wheels, but not a single one of a 73-77 Grand Prix! LOL! Thanks again. I have some information in here....take it for what its worth. I have as big as I can fit with my new set up . Interesting that a 255 is tight on your car. I have a 275/60/15, and I've got over an inch to the inside, with two inches of usable space to the wheel well lip. The other day I measured from the inside of the outer wheelhouse to the inside wheelhouse, and I've got a tick under 14 inches of width available on the rear. As soon as I am able to get back in the shop, I'm going to borrow a 315/50/15 that's on a 11" wide wheel from a friend and see how it fits. I'll likely end up with a 17 or 18 inch diameter wheel, but it's sorta frustrating because there are not many good all season tires available in the wider widths that are 27-28" tall. Don't want to run a drag radial in the winter or when it's raining outside, and I don't want to run a 25-26" tall tire. The one combo that looks halfway promising is the 275/50/17 on a 17x9, but I have a good idea that I can fit wider. We'll see. Tquillen wrote: The one combo that looks halfway promising is the 275/50/17 on a 17x9, but I have a good idea that I can fit wider. We'll see. FWIW, that's the exact setup I have on mine, though I have 6" of backspacing. It works, but it's about as tight as I can get with no rubbing. 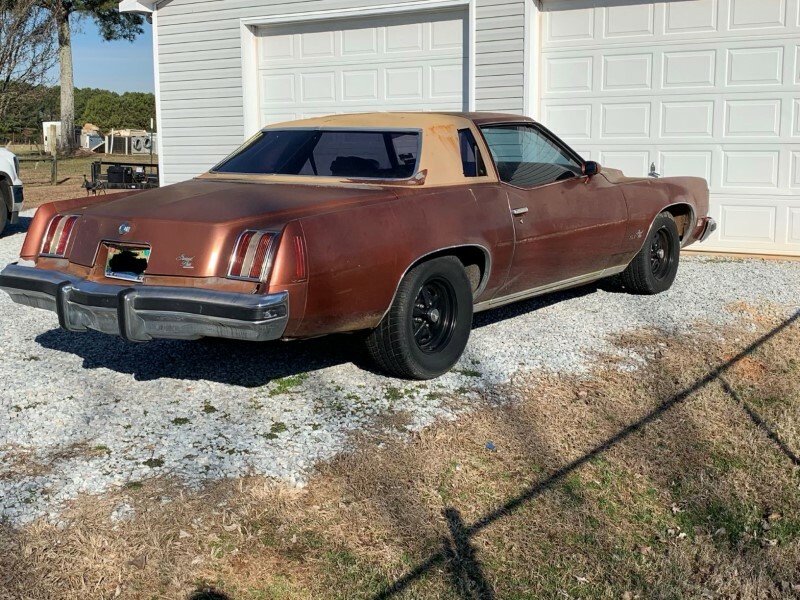 Others have reported more room, and some of the Chevelles seem to be able to swallow a 315, so it seems to me there's at least some variation across the G3's. The other issue is that tire width in millimeters is nominal. No matter what width you choose, the actual width will be somewhat less, and two different manufacturers' tires (or even styles within the same manufacturer) will vary between each other. So tire A and B are labeled '275', but tire A might be 9.75" and tire B might be 9.5". Neither will be 10.83", which is what 275 actually works out to in inches. When you're looking to push the limits of the wells, there can be a lot of trial and error with tire sizes. "so it seems to me there's at least some variation across the G3's. When you're looking to push the limits of the wells, there can be a lot of trial and error with tire sizes." Both of these statements are VERY true. In fitting wheel/tire combos on drag cars, you pretty much have to measure the car in front of you, with one of the exact tires you want to run, on a wheel with known dimensions. I'm planning on doing the same here. Based on what I see right now, the 275/50/17 is a real safe bet front and rear. I'd like to go wider on the rear, but there's just not much available. TQuillen , Don't know if your read far enough into my thread. Rear : I installed 295/ 45 's in June 2018 they have the 18 x 9.5 rims. Rear spring compressed , I have 3/8" clearance between the sidewall and inner fender lip. Front : 255 /50 on 18 X9.5 . But keep in mind I performed the late model B-BODY spindle upgrade which brings the wheels inboard approx. 1/4" LEAVING me 3/8" of clearance lock to lock before touching the frame. When I bought this car, it had 255/50/15s on the front and had an enormous amount of room left. I replaced those tires because they were severely dry rotted. Have you seen the article with Seth Rich's 73 Chevelle? The car started out with 285/40/17s on 17x9 wheels with 5" backspace on all four corners with zero modifications to the frame/wheel wells. Then, he stretched the rears 1.25", and kept the 285s on the rear. Still no mods. Then, he went to a 315/35 on the rear with no issues (not sure if he trimmed the wheel well lip, don't think so). Last I read, he was going to put the 315s on the front and go with a 335 on the rear, but he seems to have slipped into radio silence since then. I sure would like to talk to him about that deal. There are tons of picture online of that car. 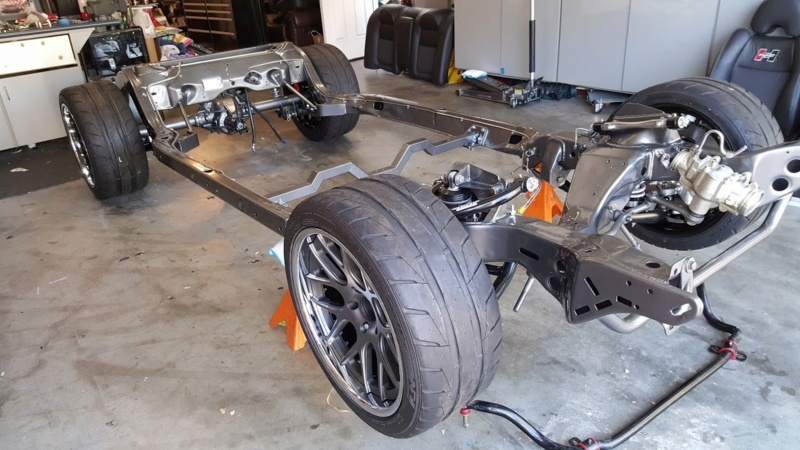 Here's another great demonstration that yes, there are significant differences on the 73-77 cars, and yes, we need to be really careful when we measure up for tires and wheel fitments on our cars! This guy has a 73 Pontiac Grand Am. Front wheel/tire is 19x9.5 with a 275/35/19, rear is 19x11 with a 305/35/19. While I prefer a bit more sidewall (personal preference only), it does show what can fit on some of these cars with zero wheel well modifications. Also of note is that this car has Nitto tires as well, which seem to run a little smaller than other brands (or are the other brands bigger than the Nitto? LOL). This is undoubtedly one of the better, if not the best, looking Pro Touring style 73-77 G3's that I've seen. Mine are NITTOS as well. ALL my rims , 5.25" backspace. By the way , I think this guy with the BAD A$$$ Grand Am has his complete build thread on PRO-TOURING.COM ? Yessir. That's where the pictures came from. Seth Rich has his build there as well, 73 Chevelle/Laguna. It's called Project Bad Buzz.